Getting The “Royal” Treatment | Robert S. Minch, D.D.S., P.A. The well dressed, official looking man walked into my office last month and made a request that immediately got my attention. Would I be willing to treat a member of a royal family from the Middle East. I’d like to think that we give each patient in our practice the “royal” treatment. I mean, really, we truly appreciate you coming to us for your dental work and we aim to provide maximum value every step of the way. So, imagine my surprise, when I was asked to treat a member of a royal family- a 27 year old Sheik who was in town to get some medical treatments at Johns Hopkins. Because I am on staff there, he was referred to my office to evaluate his teeth. 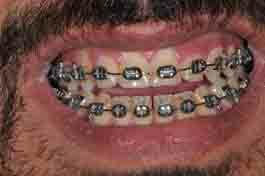 H.(I want to maintain his privacy) came to me because his front teeth did not meet and he had been wearing braces for 10 years to correct it. His other option was jaw surgery and could I do something a little less drastic for him. Turns out that H. was a very nice young man who just wanted what everyone else wants- a nice white smile. 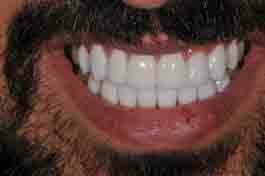 So after my normal consultation work up (full exam, digital pictures and impressions for study models) I assured him that I could make porcelain veneers on his upper and lower front teeth to close his bite as well as make him an even more handsome Sheik …..Oh, did I mention that he was in town for just 2 weeks?? Well, to make a long story short, we rearranged our schedule to start the very next day. I know what you’re thinking- “sure, for a Sheik he rearranges his schedule!” But I assure you, we provide this level of service to every patient desirous of a beautiful healthy smile. In any event, H. was an excellent patient throughout that morning, all the way up to when he saw his new teeth- temporary veneers, to be sure , but very close to what his final smile would be. When he looked in the mirror, H. was overcome with emotion, and a little worried that he might look “too good”. I assured him that any change takes a little time to get used to but that I could always change the shape/color or look if he so desired. It’s all part of the “royal treatment” that we lavish on EVERY patient who walks in our door. H. bounded into my office the very next morning exclaiming for all to hear- “Doctor, I love my veneers!!!!!”. This is always music to my ears. I was able to rush the case through the artistic laboratory that I use for making the final veneers and was able to bond them in and finish his case within the allotted 2 week period. As he prepared to leave, H. gave me one of the finest compliments I have ever received. He shook my hand and thanked me for “changing his life”. I guess you could say that in the process of getting to know each other somewhat and working together to provide him with the smile that he always wanted, that we BOTH got the “Royal Treatment” ! !